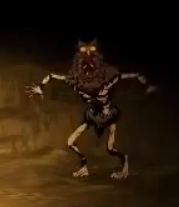 ...the Path of Nightmares served as inspiration for the design of the Screecher in the Don't Starve mod, didn't it? From the red colour scheme to the way the big mouth is mixed with the small beak, and the way those eyes and "ear feathers" are set up reminds me of his mask. And the feathers left in the owl's head ressemble the ninja's long hair. To be fair, the resemblance is uncanny. But that may just be because they both are naturally uncanny. True, but if I ever meet the Klei staff or have the opportunity to ask them a question, I'll go straight to these guys.